I made this pizza for Kurt and myself the other night. Don't go overboard on the ricotta (like I did) and it can be a quick and tasty dinner. Adapted (barely) from Jenna's Zucchini Pizza. Slice the onion into thin strips and cook over medium heat with some olive oil. Shred the zucchini then mix with the mozzarella. 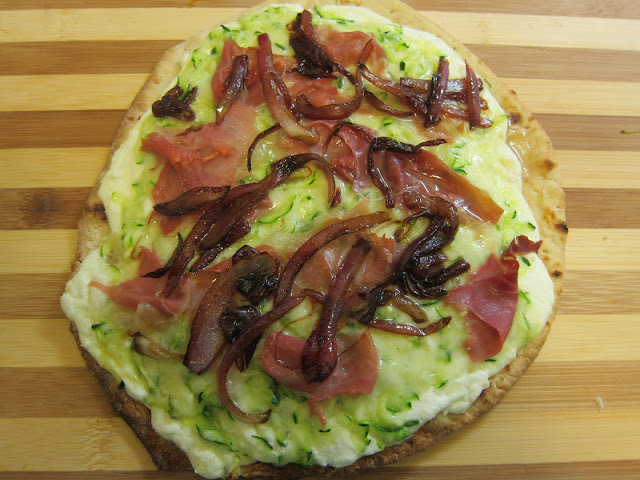 Mix your garlic with the ricotta and spread over the flat bread or dough. Top with zucchini/cheese mixture. Tear pieces of prosciutto and arrange on top. Once the onions have cooked down a lot, add a splash of water and some balsamic vinegar. Continue cooking until the liquid has evaporated then top the pizza with the carmelized onions. Bake at 400F for about 10-12 minutes until cheese is melted and crust is browned. This looks AMAZING!! I would probably follow your lead and go overboard with the cheese... love me some cheese. ooh i love this! i recently made the promise to myself that i'd get to know the zucchini much better. and i mean anything on a pizza is good, right? ?